Frequent snacking has a damaging effect on our oral health. Each time food containing sugar or starch is eaten, the bacteria in your mouth produce acids, which attack the teeth for about 20 minutes. Sugary foods should only be consumed during or directly after a meal. This will ensure the amount of acid attacks on your teeth are minimised. Sugar-free chewing gum is beneficial to increase your saliva flow and help to neutralise the acid from the bacteria and protect your teeth. Eat a well-balanced diet of fruit, vegetables, cheese, yoghurt, bread, cereals, chicken and fish. If you do snack between meals, then rinse your mouth with water. Many beverages contain a lot more sugar than you may realise, contributing to dental decay. Some drinks can also be very acidic causing erosion damage to your teeth. Soft drinks, sports drinks, fruit drinks and some alcoholic beverages are all major offenders. When you are thirsty, water is a much healthier option. 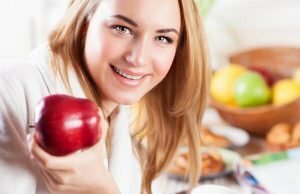 Nutrition and oral care is also very important to a woman during dental hormonal fluctuations that occur during puberty, menstruation, pregnancy, breastfeeding and menopause. Oestrogen and progesterone can increase a woman’s chances of having problems with her teeth and gums. Some medications may also play a role in disturbing this delicate balance. A rigorous oral hygiene routine is the only way to look after your oral health during these times.